Civil justice in the United States of America is a work in progress. It is still evolving into the idea that "with liberty and justice for all" applies to everyone, not just people who can afford to buy legal representation. Inspired by the possibility of closing the "justice gap," the Supreme Court of Georgia's Equal Justice Commission and the Committee on Civil Justice created a CLE seminar to explore whether a civil right to counsel is supported by the U.S. Constitution. 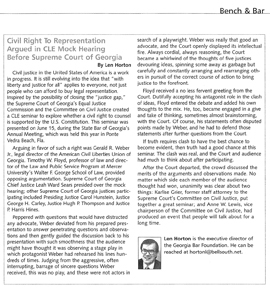 This seminar was presented on June 15, during the State Bar of Georgia's Annual Meeting, which was held this year in Ponte Vedra Beach, Fla. Arguing in favor of such a right was Gerald R. Weber Jr., legal director of the American Civil Liberties Union of Georgia. Timothy W. Floyd, professor of law and direc¨tor of the Law and Public Service Program at Mercer University's Walter F. George School of Law, provided opposing argumentation. Supreme Court of Georgia Chief Justice Leah Ward Sears presided over the mock hearing; other Supreme Court of Georgia justices partic¨ipating included Presiding Justice Carol Hunstein, Justice George H. Carley, Justice Hugh P. Thompson and Justice P. Harris Hines. Peppered with questions that would have distracted any advocate, Weber deviated from his prepared pres¨entation to answer penetrating questions and observations and then gently guided the discussion back to his presentation with such smoothness that the audience might have thought it was observing a stage play in which protagonist Weber had rehearsed his lines hundreds of times. Judging from the aggressive, often interrupting, barrage of sincere questions Weber received, this was no play, and these were not actors in search of a playwright. Weber was really that good an advocate, and the Court openly displayed its intellectual fire. Always cordial, always reasoning, the Court became a whirlwind of the thoughts of five justices devouring ideas, spinning some away as garbage but carefully and constantly arranging and rearranging others in pursuit of the correct course of action to bring justice to the forefront. Floyd received a no less fervent greeting from the Court. Dutifully accepting his antagonist role in the clash of ideas, Floyd entered the debate and added his own thoughts to the mix. He, too, became engaged in a give and take of thinking, sometimes almost brainstorming, with the Court. Of course, his statements often disputed points made by Weber, and he had to defend those statements after further questions from the Court. If truth requires clash to have the best chance to become evident, then truth had a good chance at this seminar. The clash was real, and the Court and audience had much to think about after participating. After the Court departed, the crowd discussed the merits of the arguments and observations made. No matter which side each member of the audience thought had won, unanimity was clear about two things: Karlise Grier, former staff attorney to the Supreme Court's Committee on Civil Justice, put together a great seminar; and Anne W. Lewis, vice chairperson of the Committee on Civil Justice, had produced an event that people will talk about for a long time. Len Horton is the executive director of the Georgia Bar Foundation. He can be reached at hortonl@bellsouth.net.